*Today was just one of those really fantastic days, from beginning to end. *I started out the day getting some good news on an aspect of my job that I had been wondering about. It looks like a plan is being put in place, and it will work out for my future plans. *I worked with one of the juniors to help get her going on preparing to write scholarship information, to get ahead of the game for next year. *I had a nice visit with the new KHS part time counselor, and how I can help her transition into her new job. *I came home and had a video conference with my PA. (Instead of driving to Coeur d’Alene, I can now do a video conference with her for certain types of appointments. How cool is that?) I wanted to talk to her about some of my medications, and the results from my blood work I received when I did the free SMC blood draw. I shared with her how I had lost about 30 pounds, and I shared with her the numbers from my blood work, and she said I could go off my cholesterol medication. Woo Hoo!! I was hoping that was going to happen with my new way of eating. I will have my blood work rechecked in August to make sure everything is looking good, but the news about going off my cholesterol meds was just what I wanted to hear. *I spent the afternoon working on helping to write sections of the new Gear Up grant for the Kellogg School District. One of the sections I wrote was a “Prior Success Narrative”. It was very exciting to go through data and get it down on paper, and show what an impact the Gear Up program has had on the students in our school district over the past 11 years. I hope everything works out, and the KSD gets another Gear Up grant. It truly is a wonderful program. *It is only June 5, and I have already completed two books. I have a lot of novels on my Kindle that I am trying to read. So far, I have read Match Making for Beginners by Maddie Dawson, and The Odds of Loving Grover Cleveland by Rebekah Crane. The first book was a fun read. The second book is a YA fiction book, and when it started I thought it was going to be a kind of depressing book about teens, and it didn’t look promising. But I was wrong. I really grew fond of the characters and the story. Today I started a novel by Loretta Nyhan titled Digging In: A Novel. *The evening ended with Paul and I playing a game of Bocce ball in the backyard. 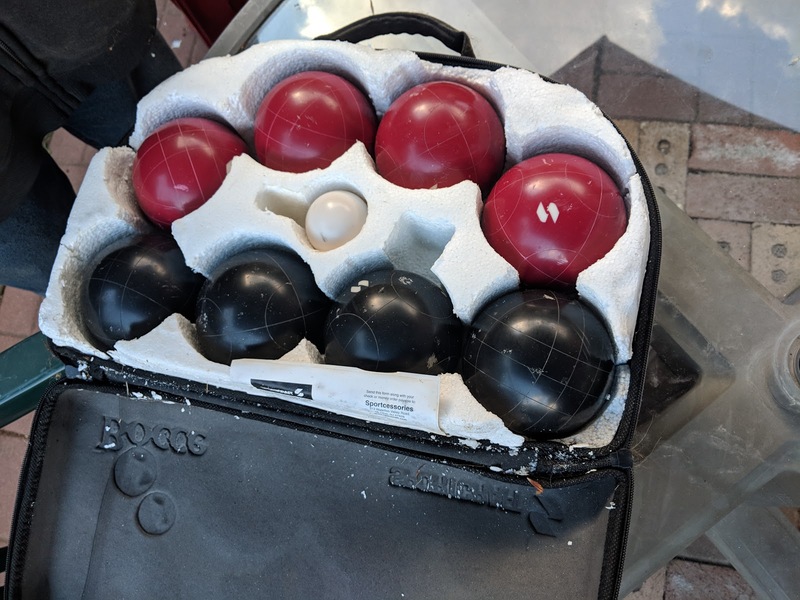 It was fun to play, and get warmed up for further Bocce ball matches in the future.